Sometimes only UNIQUE get well gifts will do. Something that tells your loved one that you care, something original, something that will make them smile every time they look at it, and inspire them to wellness. Rainbow Get Well Captured Wishes will do just that. No matter what their favorite color is, you'll find it in this delightful all-in-one gift package. Our company's philosophy is based on helping you to make your loved ones understand just how you feel. 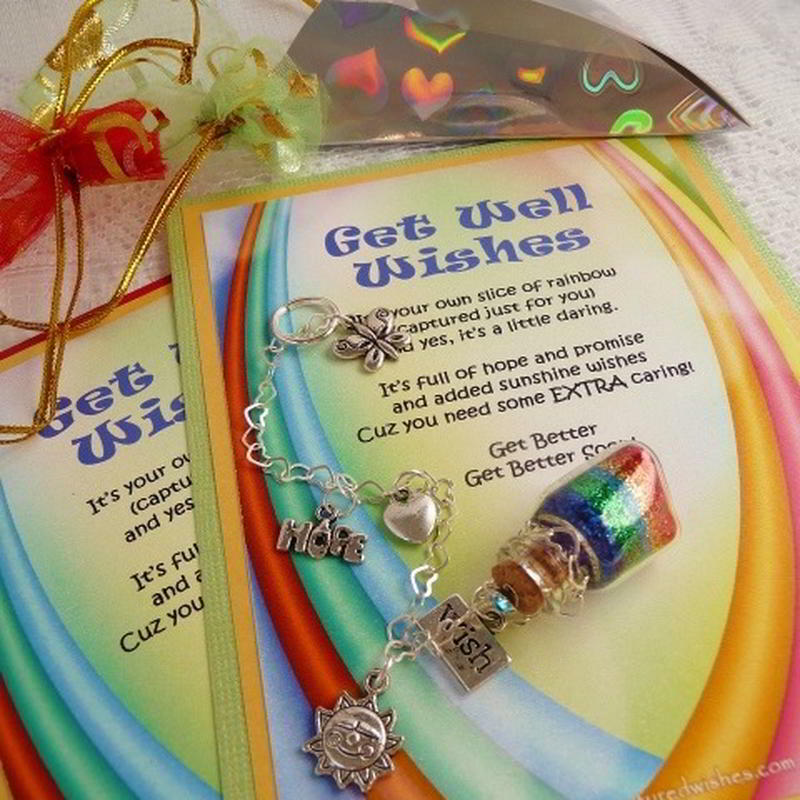 Rainbow Get Well Wishes tells the gift recipient that you are thinking of them during their difficult time. They can look at it and immediately know your thoughts are with them, every hour of the journey to recovery. Your loved one will adore the gesture as much as she does the delicate Captured Wish vessel with its layers of Fairy Dust and shiny charms. The Wish vessel is triangular in shape and measures 20 mm height by 15 mm width. It contains carefully layered Fairy Dust, representing every color of the rainbow, a symbolism of hope for all things good. The Rainbow Get Well Wishes gift comes with a suction cup for hanging, so your friend can display it prominently and feel better every time they look at it.